Every season seems to have it’s thing as far as a specific piece of produce that’s been associated with it for as far back as anyone can remember. For example, pumpkin. The entirety of Fall is pumpkin ev-er-y-thang- Thanksgiving especially.Think about it. Do you eat pumpkin anything outside of that specific season? I can honestly say that I don’t. It never even really occurs to me. For Easter, it’s carrots, a bit obvious given the season’s association with the much-loved Easter Bunny. 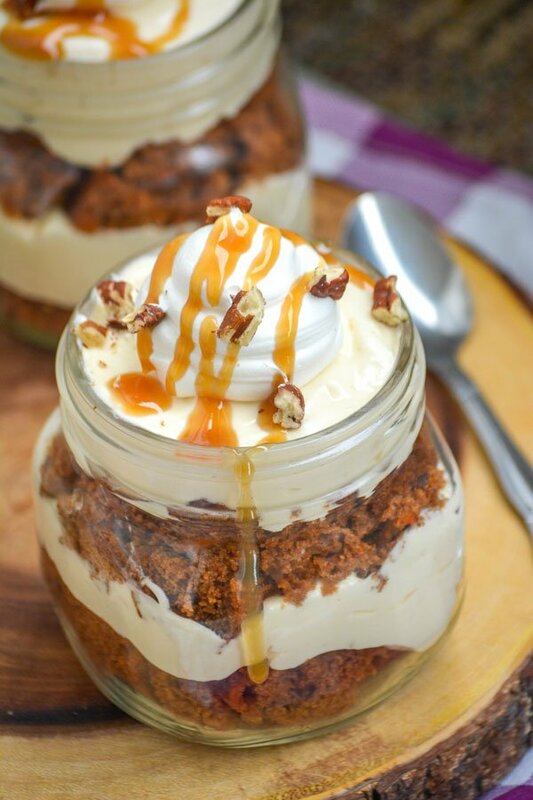 More specifically than just carrots themselves, but carrot cake. Kinda like pumpkin, I never find myself craving or enjoying the traditional dessert any other time of the year. So it’s Spring and Easter Sunday is right around the corner, so cue my craving for the moist carrot flecked raisin filled sweet spice cake. And wouldn’t you know while I was dreaming about carrot cake and what yummy way I’d bring you some this week, I got to wondering about it. What is it and where did it come from? I mean ‘cake’ or cake as we know it is a relatively new dessert term, but people all over the world claim this dessert originated here or there hundreds of years ago. What’s the deal? Here’s what I found out, some of which I already knew, but not how it applied to the creation and evolution of this dessert. Way back when, we’re talking Medieval times, sugar (and pretty much all sweeteners of the like) was expensive. Too expensive for everyday people, but a sweettooth knows no class or income level. So the not so rich turned to carrots, for their natural sweetness, as a substitue stirred into the batter. However, as I mentioned earlier, they wouldn’t have and didn’t call it cake. It was instead known as Carrot Pudding. Still a spike cake, resembling a cake like substance but anything like that was called ‘pudding’. If you’ve ever heard of or eaten bread pudding, it might give you an idea of what an original carrot pudding looked like and it’s texture. Rationing made it popular in the U.S. after WWII. Somewhere in it’s journey across the pond, it evolved into the moist, fluffy spice cake we know today baked in cake or loaf pans, incorporating nuts and raisins into the batter, and even adopting a tradition of a cream cheese frosting topping. Eventually, largely due to the popularity of the Easter Bunny here and his obvious love for all things carrot- it became a mainstay and tradition at Easter dinners everywhere. Where it’s now the significant dessert synonymous with the holiday and the season. Whew, that was a mouthful. Ok, history lesson’s over. For real though, if you haven’t yet enjoyed it- I highly suggest you try it. 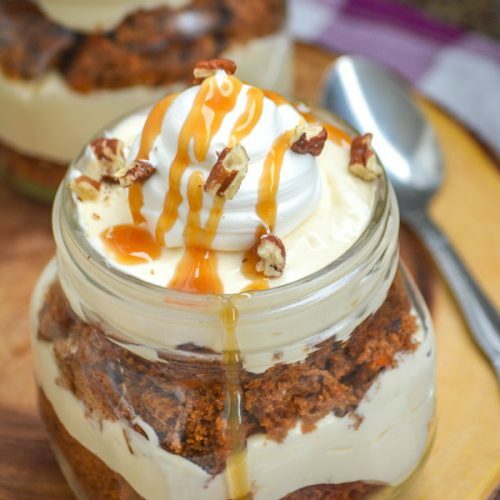 Try it in it’s natural form, or jump off the deep in and dive straight into a deep dish of these Carrot Cake Cream Cheese Pudding Trifles. You won’t ever look back. So it’s Easter Sweets Week which naturally meant I’d have to do something with carrot cake. I figured, go big or go home- especially since if you’re celebrating Easter, there’s much to celebrate and cherish. Even if it’s not Easter (or even Spring), but you get a hankering for it- this dessert is never a bad idea. These trifles weren’t meant to be put in that kinda corner. 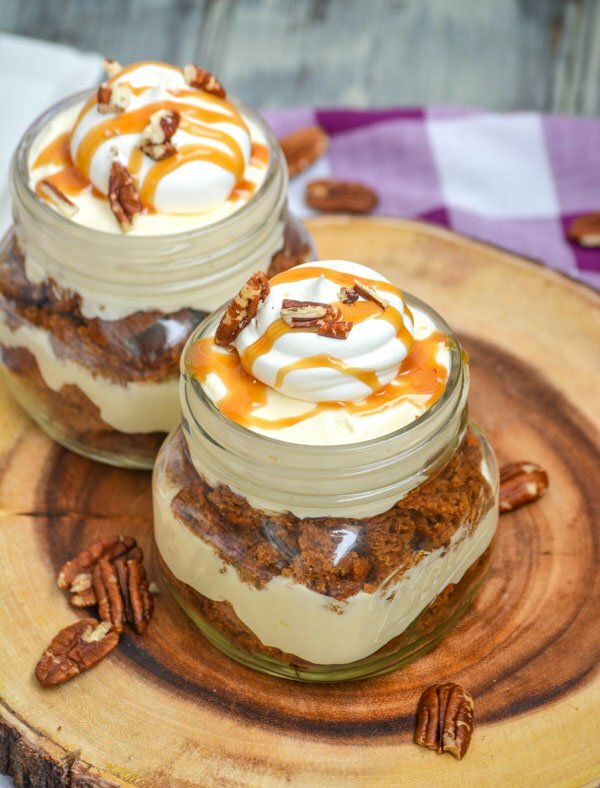 While offering a stunning presentation whatever occasion you decide to serve them for, these trifles are surprisingly easy to make and assemble. You can either use a store bought carrot cake, cutting out an extra step, or bake one. Homemade is great, but I’m often pressed for time cooking for big events. I used a box of Duncan Hines Classic Carrot cake, with real carrots & raisins, baked and cooled according to the package directions. Then cut into 1/2″ squares. 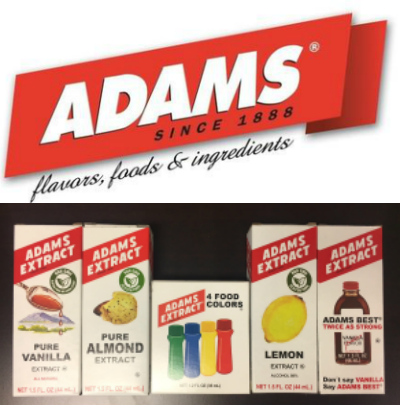 For the cream cheese pudding layer, I used real cream cheese blended with cheesecake pudding mix and flavored with yummy Adam’s Extract vanilla extract. Super simple, but rich and flavorful it was begging to be paired with that cake in some kinda shape or form. Starting with the carrot cake, I alternated layers of the crumbled cake and pudding mixture until it was flush with the top. I gave each jar a gentle plop on the counter to make sure everything was settled. 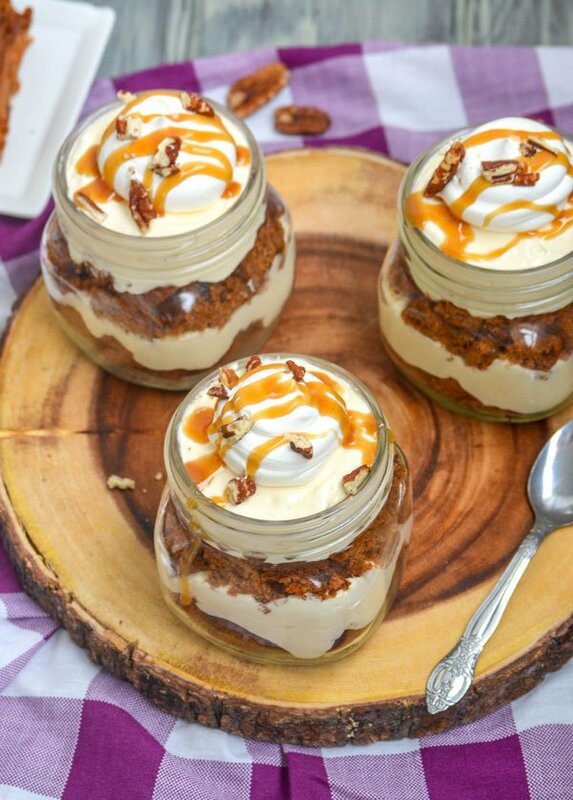 To top I piped on a dollop of thawed whipped topping, drizzled with thick caramel syrup, and sprinkled with some roughly chopped pecans. 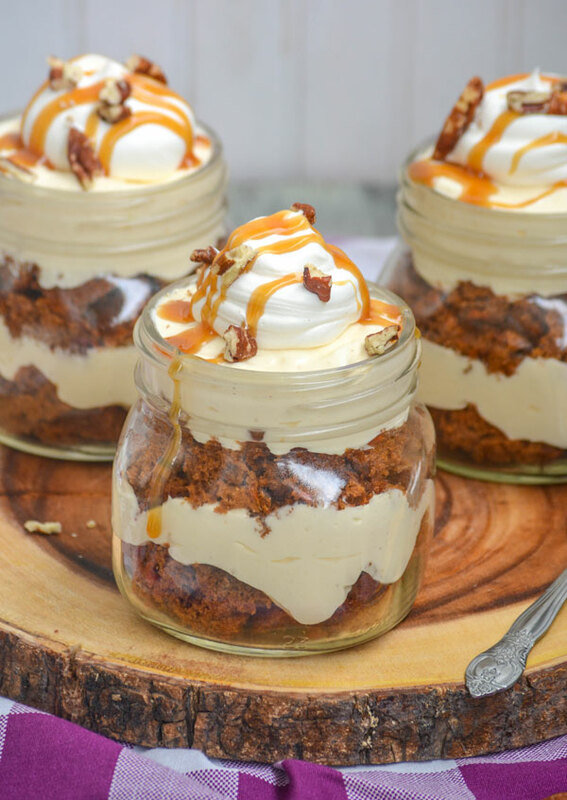 If you don’t have a trifle bowl, or mini ones, you can also use mason jars, or even glass ware. Basically anything where your guests can enjoy your dessert’s gorgeous presentation. You eat first with your eyes, and this is guaranteed to get their taste buds excited. 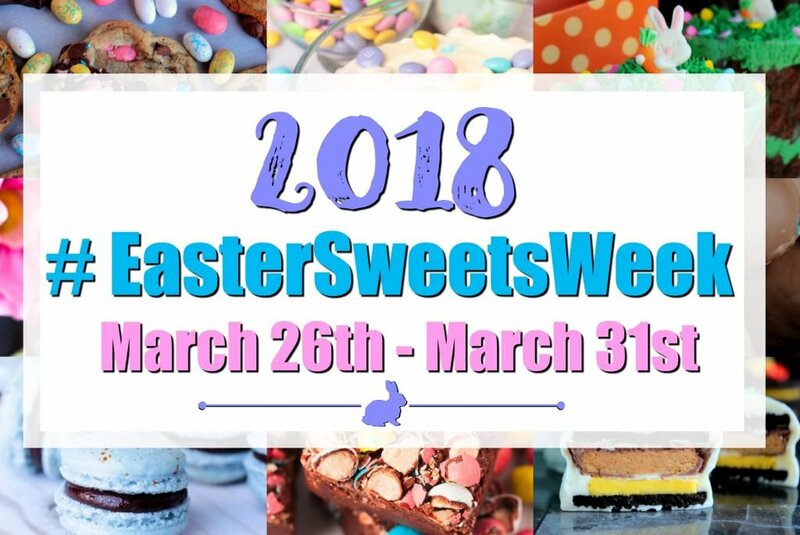 You might also enjoy these other Easter style sweets: Carrot Cake Donuts with Cream Cheese Glaze, Strawberry Cream Cheese Bunny Buns, Peeps Pudding Cups, and Carrot Cake Pudding Cups. 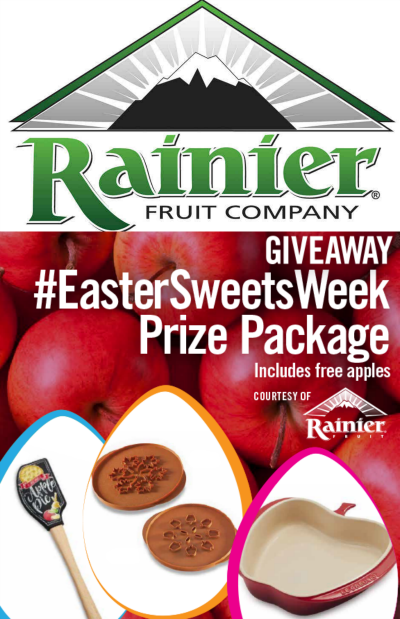 DON’T for get to keep scrolling and enter the #EasterSweetWeek GIVEAWAY for a chance to WIN an awesome PRIZEPACK!! 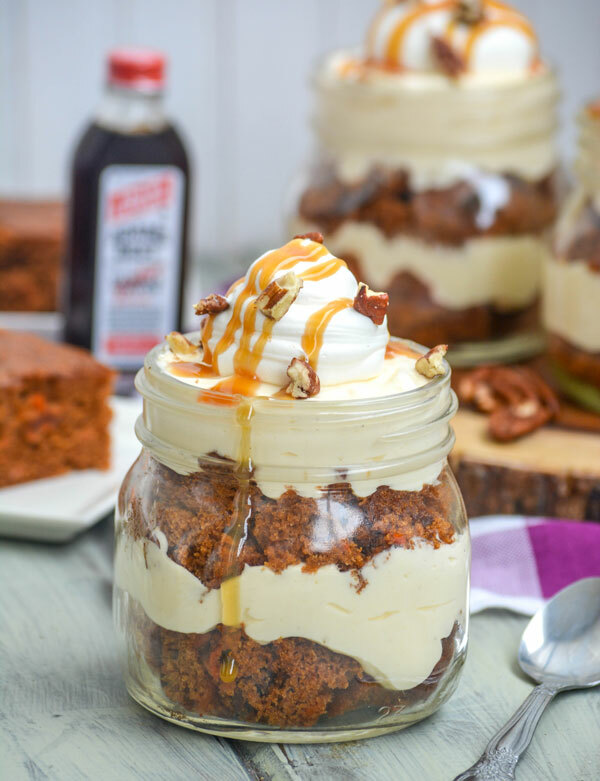 A decadent trifle, this version is perfect for Easter featuring alternating layers of crumbled carrot cake and a lucious cream cheese cheesecake pudding, and whipped topping and a garnish of thick caramel syrup and chopped nuts. Bake your cake according to the package directions. Set aside and let it cool completely. Add the cream cheese to the bowl of a stand mixer, whip until nice and creamy. Slowly whip in the milk, a bit at a time until it's all completely incorporated. Pour in the pudding mix, and whip again until thick and creamy. Fold in the extract and half the whipped topping until evenly incorporated. Run a knife around the edges of your cake, or cakes, to loosen them and turn them out onto a cutting board. Cut them into 1/2" cubes. To the bottom of your dish or dishes, layer some of the cake cubes out evenly. Top with a thick layer of the cream cheese pudding mixture. Repeat until the layers reach the top. Refrigerate for 30 minute-an hour to chill. Transfer the rest of the thawed whipped topping to a gallon sized freezer bag. Twist the top to seal and push it all down to one corner. 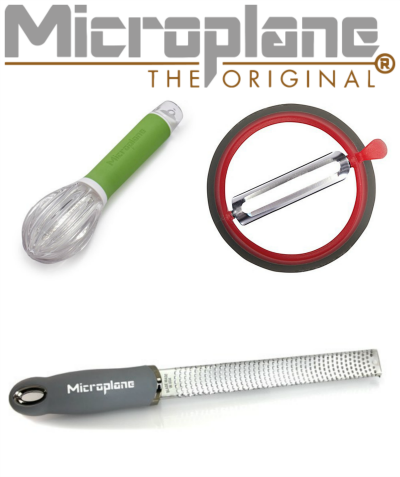 Snip off an end, and squeeze a generous dollop onto the top of each trifle. Drizzle the tops with caramel syrup and then sprinkle with chopped nuts. Serve immediately. If serving after dinner, coffee pairs very well with these desserts. 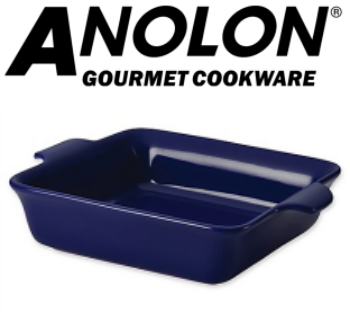 Serving size will depend almost entirely on what size vessel you're layering them in. For this sized mason jar, we got 5 generous servings. For something smaller, like 2/3 of a cup each you could get as many as 12. 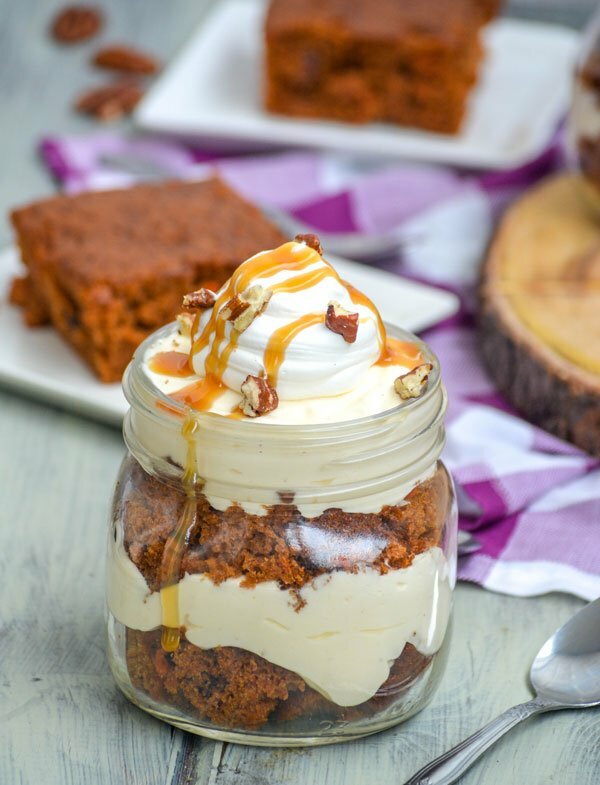 I’ve never met a carrot cake dessert that I didn’t love! Your trifles look fabulous!!! Oh my gosh, these look amazing and perfect for Easter!